This vintage real photo postcard features a young and pretty pastry chef holding a tray of delectable desserts in one hand and a bouquet of flowers in the other hand. She is wearing a chef uniform, including her hat. Note her sporty shoes and high socks. The postcard has a Belgian stamp and a postmark from Lokoren, Belgium. The postcard was mailed in 1909. This postcard is in very good condition (see scans). This vintage real photo postcard features what may be some photographer’s fantasy. Nothing beats having a bottle of champagne and a pretty young lady chilling on ice. I doubt that many men have actually ever had such a thought. If I was a psychologist, which in fact I am, I might be thinking that the bottle of champagne is a perfect example of a phallic symbol. I wonder if the photographer realized he had created a subliminal sexually charged image when he took this photograph. I’m not sure how to interpret the spider web in the background. If you haven’t noticed, this postcard is celebrating a New Year. The reverse of the card shows a postmark from Brussels, Belgium and indicates the date was December 31st, between 1918 and 1919. The stamp on the postcard is also from Belgium. This photograph captures three couples gathered around a “tricked out” sled on a winter day. There is snow on the ground and the woman are wearing weather appropriate footwear. Interestingly, only three of the subjects are paying attention to the camera. It is also notable that the individuals in this image are not dressed for frolicking in the snow. My guess is that they may have been out walking and happened upon the sled. One of them may have thought the sled presented them with a terrific photo opportunity. This photograph, according to an inscription on the reverse of the image, was taken in Spa, Belgium. The photograph was shot at the Chalet de Geronstere in 1933. Spa is a town in the Province of Liege, Belgium. It is situated in a valley in the Ardennes mountains. 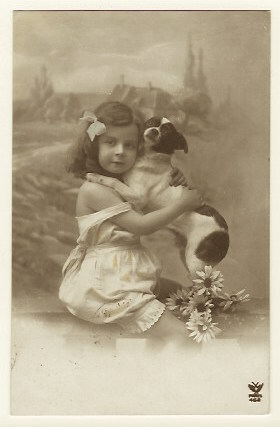 This vintage real photo postcard features a portrait of an adorable little girl posing with her cute dog. The dog is captured by the photographer in a loving pose with the canine’s paws atop the little girl’s shoulders. 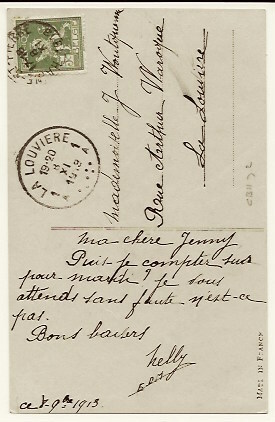 The postcard was published in France but has a Belgian stamp and postmark (La Louviere). The postmark and the message from the sender indicates that the postcard was written and sent in 1913. . 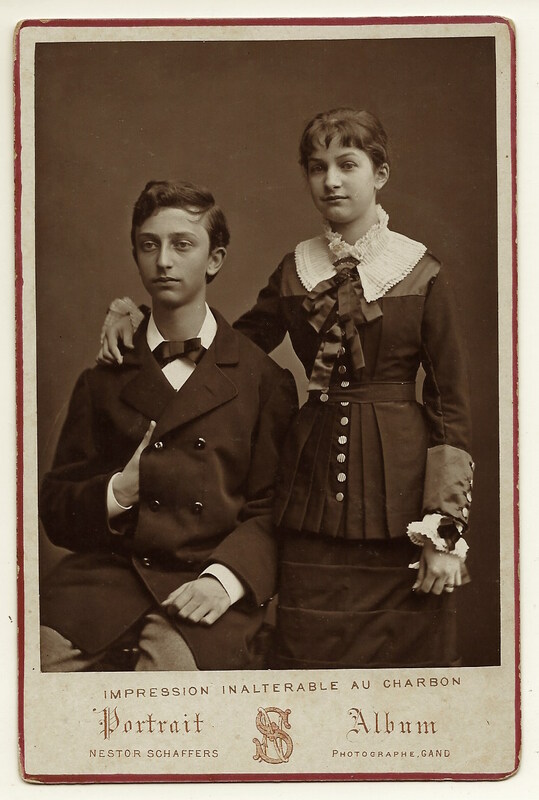 This cabinet card portrait features what appears to be teenage siblings. They are posing at the studio of Nestor Schaffers in Gand (Ghent), Belgium. The sister is well dressed. Note her lace sleeves, collar, and bib. The brother is wearing a double breasted jacket and a bow tie. He has adopted a Napoleon type pose by placing his hand under his jacket. The sister has her hand affectionately on her brother’s shoulder. The cabinet card has a distinctive red border. 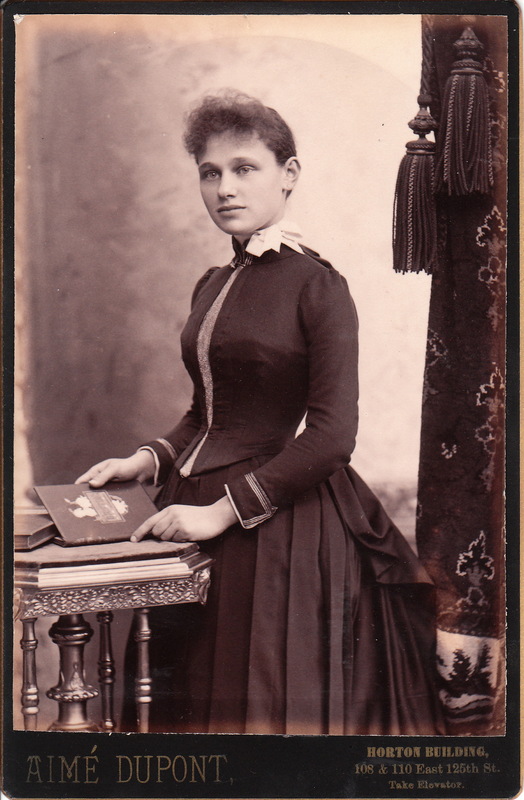 This cabinet card features an attractive young woman posed holding a book. The woman is nicely dressed and has a lovely figure. Her great figure is, no doubt, assisted by her tight corset. The book she is holding is entitled “Grifting“. The definition of grifting is “engaging in petty swindling”. What is a nice girl like the girl in this image doing with such a sensational book? The most likely reason she has possession of that particular title is that; it was there in the studio. The book likely belonged to the photographer. The studio that produced this photograph was the Aime Dupont gallery. Dupont (1842-1900) founded his photography business in 1886 in New York City, New York. He was formerly a sculptor and he was of Belgian origin. His American wife, Etta Greer, was also a photographer. She was well respected for he work as a portraitist of opera singers in Paris, France. She was educated in Paris and spent much of her childhood there. She also met and married Dupont in Paris. The couple was very talented and they became very popular as portrait photographers in New York. Among their society and celebrity clients were many singers who were appearing in New York. After Dupont’s death, his wife, and later his son (Albert), operated the studio. His wife kept the name of the studio the same, after the death of her husband. In 1906, the Metropolitan Opera hired its own official photographer, resulting in diminished portrait work in that sector. The studio went bankrupt in 1920. A couple of interesting questions about this photograph remain unanswered. Is the subject of this photograph someone famous in society or the performing arts? Who was the photographer, was it Aimee Dupont, or his wife, Etta? 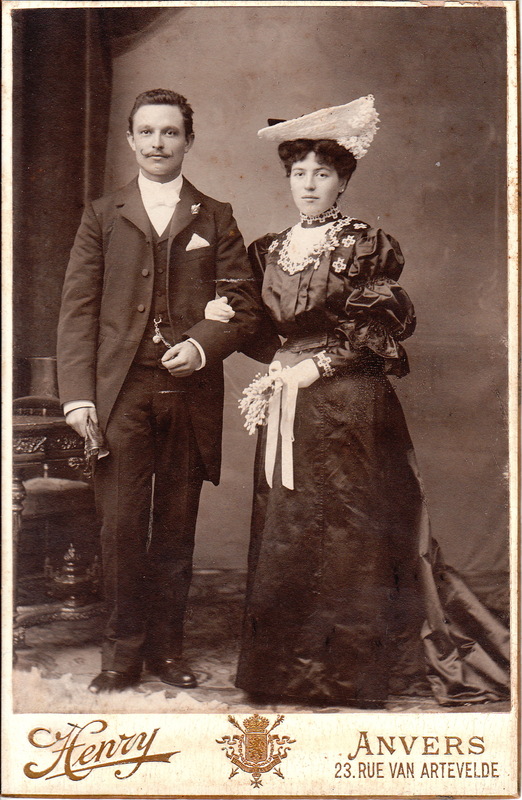 A very attractive and fashionable couple pose for their portrait at the Henry studio in Anvers, Belgium. The gentleman appears to be holding gloves. His top hat is visible on the table behind him. The lovely lady is wearing a beautiful dress and a fancy hat. She is also wearing white gloves and holding a bouquet of flowers. This image may be a wedding photograph. The backstamp of the cabinet card indicates that the photographer, Henry, was the winner of a photography medal at the World Exposition in 1894. Anvers, the home of Henry’s studio, was a port and financial center in northern Belgium. The city is located on the Scheldt river and was a center for the diamond industry. Anvers was also the home of the first stock exchange (1460). Anvers is the french name for Antwerp.